Daniel Brunier runs Vieux Télégraphe, one of Châteauneuf-du-Pape's top domaines. Daniel Brunier, 46, is vigneron and owner of Domaine du Vieux Télégraphe and La Roquète in Châteauneuf-du-Pape, along with his brother, Frédéric. He also co-owns Domaine Les Pallières in Gigondas with U.S.-based wine importer Kermit Lynch. Vieux Télégraphe was established in 1898 by Hypolithe Brunier on the highest terrace of the Châteauneuf-du-Pape appellation, called Plateau de la Crau. Today, the domaine extends over 170 acres and is one of Châteauneuf-du-Pape's leading wineries year in and year out. Brunier and his brother purchased La Roquète in 1986, and they recently completed a renovation of the winery, which is located in the center of Châteauneuf-du-Pape. Unlike the one domaine-one wine theory practiced at Vieux Télégraphe, La Roquète has introduced a small-production cuvée, called L'Accent, culled from its best vineyard parcels, to go alongside the regular cuvée. Wine Spectator: What was your first vintage at Vieux Télégraphe? Daniel Brunier: I began in 1981 at VT, my brother had just arrived two years before me. Our father Henri retired in 1986. WS: You own two properties in Châteauneuf-du-Pape, so in essence they compete with each other. How do you manage that? DB: That's right. VT and La Roquète compete in some way. We produce in both wineries red and white Châteauneuf-du-Pape. But you know that the appellation is built from very different soils and microclimates that create very different wines. This is the case with VT and Roquète: VT is based 100 percent on [grapes from] the La Crau plateau, which is well known for producing grapes with a big potential for minerality and richness. La Roquète is divided among three different vineyards: Les Pialons, Pignan and Colombis. This blend of different vineyards brings a very special personality to the wine. The main goal for us is to create two Châteauneufs, very respectful of their own terroir. … We hope that, when people taste the two wines, they really judge the wines as if they were produced by different growers. To create two different wines, at different price levels, makes the competition easier and oftentimes it's very helpful for customers who look for more than one Châteauneuf in their portfolio. Since the 2003 vintage, the two wines are also very different regarding their packaging, bottle, etc. WS: What are some of the changes you've made at Vieux Télégraphe over the years? DB: We really worked together, my brother Frédéric and I, during the last 20 or so years. So, in the winemaking, I cannot say "I." I think we've improved the expression of the tannins in our red wines. That was a very early subject of research. With the same potential of tannins, we tried to have a better balance and integration of the structure. The idea was not to eliminate them and change the style of our wines, but to really create balance. We also worked on how to keep the freshness in our Grenache wines. Of course everything is linked--fruit potential, tannins, richness, minerality, depth. We discovered early on that the master word in our region is "balance." And I think we produce more balanced wines [now] than we did [in the past]. Regarding the white wines, we can say easily that we have improved their complexity, depth and freshness. We have used large-volume barrels in the winemaking and aging process. We have changed completely the style of our white wines since the '80s. The style is now more adapted to the climate of the region and the soils. WS: What is your favorite food pairing with red Châteauneuf-du-Pape? And with white Châteauneuf-du-Pape? DB: It's well-known that with our reds the best food is lamb. But of course it depends on the age of the wine; a very young red matches very well also with red meat, an older one can be superb with game. Olive oil and Provençal vegetables match very well with our reds. Some cheeses, but not all, are also very good with red Châteauneuf-du-Pape. Regarding the white, I like scallops, crab, lobster, when the wines are young, as well as asparagus with olive oil, tomatoes and all dishes with basil. You can also have goat cheese with olive oil [with a young] white Châteauneuf. Our white wines can age as well as the reds, and when they get their maturity, after 10 years, generally, they are very good partners for black truffles and foie gras. WS: What is your favorite wine other than one of your own? DB: Sincerely, I do not have a favorite wine. I have a style that is my favorite, but not a wine. I love wines when they are real, serious, that have character and personality. I do not like at all recipe wines, simple and technical wines. I like soil, earthy taste, finesse, balance and nobleness. If I had to mention the best wine I had in my life, it would be a 1959 Château Haut-Brion, and that was about 10 years ago. 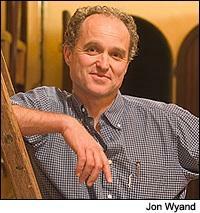 WS: If you could be one other person in the wine business for one day, who would it be, and why? DB: If it's only for a day, I'd like to be a wine critic. In one day you can just analyze the situation. I'd really like to know, with all the background of a journalist, if I'd analyze the wines I like and I know very well, with the same sensations that I have as a producer.